Awareness of your surroundings can help prevent a slip, trip or fall — you might also spot some amazing things. I live with a two year old. Jumping, climbing and dancing are skills practiced in abundance — picking up toys is not. I will regularly find a dump truck parked on the stairs, a stuffed owl guarding the hallway and blocks scattered across the living room rug. I also have a cat and will discover her toys in random places, dropped after a night of play. While these human and feline toy deposits are normal, they are also dangerous tripping hazards. Parents and pet owners may learn to expect these obstacles at home, but such dangers can be anywhere: a pothole in a parking lot, a dropped box of cereal at the grocery store or cords in the aisles at work. And thinking about your work environment is important because "slips, trips and falls" remains the second leading cause of injuries in the workplace according to the U.S. Bureau of Labor Statistics. Injuries can range from sprains and strains to cuts and fractures. In 2016 alone, there were 229,240 injuries from falls, slips or trips that resulted in employees missing days of work. Observed annually in June, National Safety Month focuses on reducing the leading causes of injury and death at work, on the road, and in our homes and communities. Here at the Architect of the Capitol (AOC), safety is one of our core values and our employees are encouraged to take ownership of it every day. For example, recently in the Thomas Jefferson Building, water was accidentally spilled on the stone floor. Water on a smooth surface becomes a slippery situation. An employee immediately stopped to guard the spill and prevent anyone from walking there until the floor was cleaned up and dried. Preventing potential injuries is a key component of safety, both in public spaces and behind the scenes in areas such as mechanical rooms, offices and hallways. In these spaces, pipes, steps and conduits are marked with yellow and black hazard tape to help draw attention to these potential threats and avert a trip or fall. 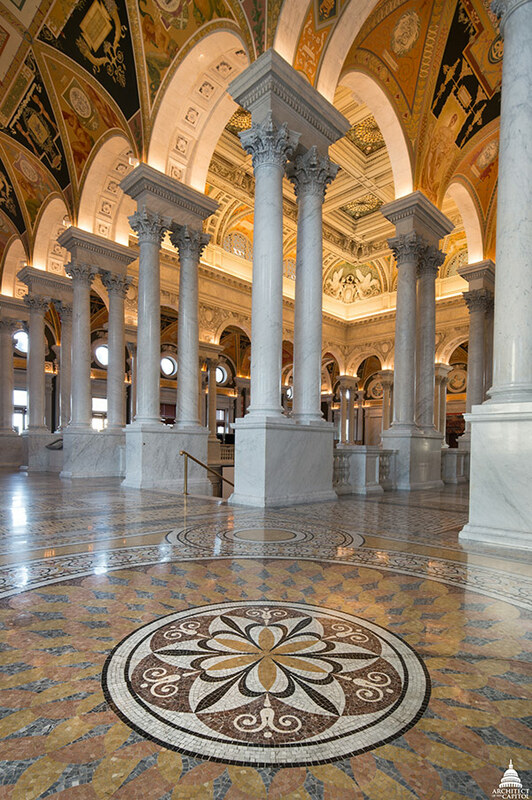 From the mosaic tiled floor to the Corinthian columns and painted archways, the Great Hall in the Jefferson Building has history and beauty worth stopping to admire. Efforts like these, to warn people of an unsafe situation with a visual warning or by standing guard and saying something, are proactive measures to help prevent injuries. One additional step we can all take in owning our personal safety is to simply pay attention. Here at the AOC when I walk through the Jefferson Building, the U.S. Capitol and others, I feel like I am walking through history where the rooms and hallways are worthy of admiration and awe from top to bottom. I pause when admiring ceilings, sculptures, the floor and other marvels because I know I am distracted from watching the rest of my surroundings. When walking, I tuck my phone away to keep my focus on other people and objects in my environment because I want to go home safe at the end of each day. Whether you work on Capitol Hill, are a regular visitor or you are planning to visit for the first time, remember to stay mindful of your surroundings — it is not only safer, you may also spot beautiful things in unexpected places that are worth your time to stop to admire.